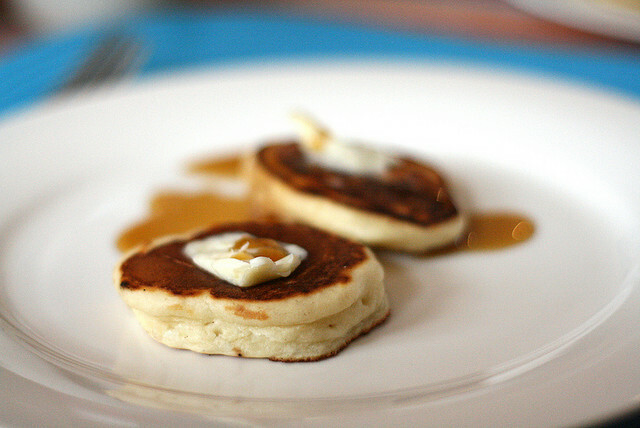 Pictured here served w/Lescure* Salted Butter & maple syrup. * A traditional style butter, but with the addition of sea salt flecks spread throughout the block. 1. Sift flour and sugar together into a bowl with a pinch of salt. 2. Whisk milk and egg together, then add to dry ingredients, whisking until smooth. 3. Heat a non-stick frypan over medium heat and brush with a little melted butter. Drop level tablespoonfuls of the mixture into the pan and cook for half a minute or until bubbles appear on the surface. 4. Turn over and cook other side for 1 minute until golden. 5. Allow to cool and serve with butter. * Makes about 25 (small).